A while back I shared this DIY Exfoliating Baking Soda Face Mask Recipe, and I thought I would come up with a little follow up. I'm hoping to do a few more of these as well! This foot scrub is SO easy to whip up before a bath or shower, and you probably have everything you need in your pantry already. Perfect! Mix together 1 tablespoon each of brown sugar, baking soda and olive oil. 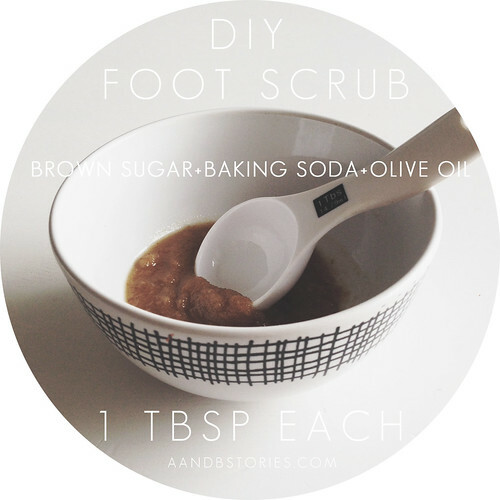 Use the scrub on your feet, knees, elbows, or any other rough areas, and rinse off well. For even better results, use an acrylic foot file on your heels before you step in to the shower (on dry feet). This one is the BEST. After your feet are nice and dry, finish off with a really thick foot lotion (I love this one) and that's it! If you made this ahead of time how should it be stored? I store mine in a mason jar in a cupboard, and it's lasted for months! Can I use white sugar? Would it be less effective? You can! It's a little finer so it won't be as gritty but it will still give you some exfoliation for sure. I would recommend coconut oil if you're looking for an alternate. Hi! I was wondering, how many times a week should I apply it? As often as you like! Feet are tough so they can handle a lot of exfoliation, I would go with once a week and see how you like it. Can u use baking powder? I don't think you'll get the same results but you could give it a try, wouldn't hurt! How long should i apply the scrub for? 30 mins? No this is more of a scrub then rinse off kind of thing, just use it in the shower like a regular foot scrub. Hope that helps!